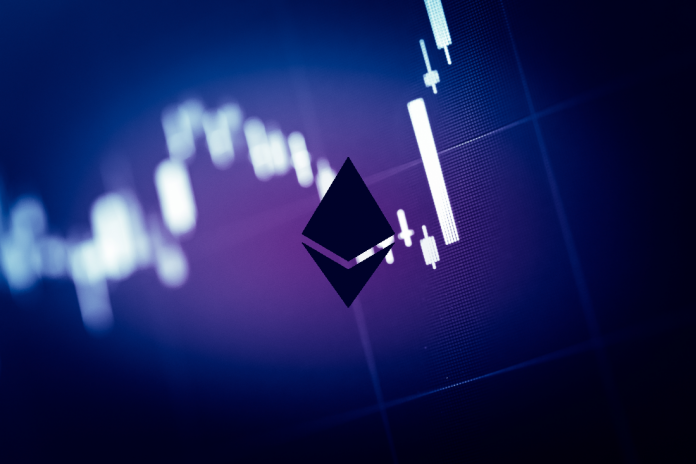 The crypto market started moving up on Tuesday, the ETH not being an exception, currently trading at around $150.67. On D1, the ascending trend is continuing, with the immediate target at 23.60% Fibo, or $185.45, and another one at the round number of $200. 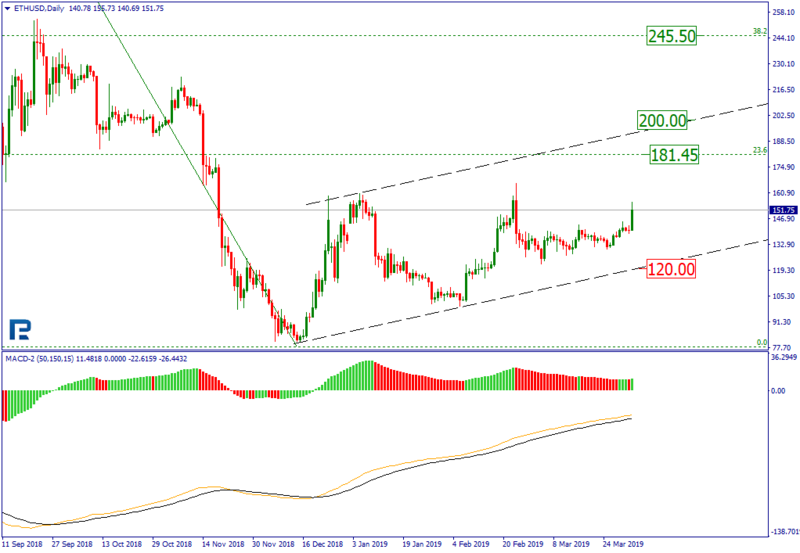 The MACD is confirming the trend momentum in the midterm, while the support lies at $120. The price may also continue its correction to 38.20%, or $245.50. On H4, the short term ascending channel is being tested bottom up, while the price has already reached 76% Fibo. The next potential target lies at the high of $166.04, with the ETH possibly staying above the resistance. The support is at $134.85. On H1, the Stochastic is forming a local divergence, which signals a correction is near. 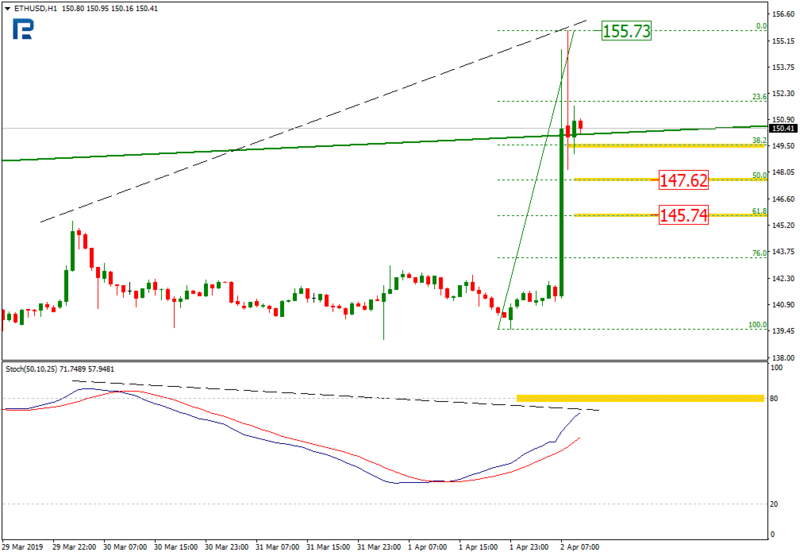 The pullback has reached 38.20% Fibo so far, and may continue to 50% ($147.62) and 61.80% ($145.74). Meanwhile, the local resistance is at $155.73. At Bloomberg, they think the crypto industry is going to change a lot; this affects the Ethereum as well, with both Stellar and EOS being very near, in terms of the competition. Kyle Samani, a founder at Milticoin Capital Management, does not consider Ethereum a decentralized app (DAPP) leader anymore. Over the last nine months, other DAPP platforms have achieved much more success. As such, with 100% DAPPs belonging to Ethereum a year ago, only 28% do now. Around 48% of DAPPs are now based on EOS. The most important thing here is the transaction speed. A year ago, Ethereum was king, while it’s a very different story now. The new networks have no performance issues, and, thus, Ethereum is losing its users, which also weakens the underlying crypto. Besides, Ether has been a loser in the ICO segment, with EOS being in the forefront. Thus, most likely, it is the lack of tech advancement that prevented the Ether from recovering in full.